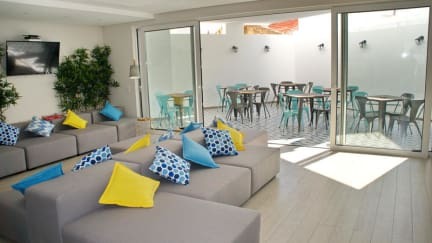 Top City Hostel & Suites i Lagos, Portugal : Boka nu! Really nice and fresh hostel with amazing common areas. Only negative thing was that there was no locker assigned to my bed. There were lockers for about half of the beds in my dorm, so I don’t know if you were supposed to pay extra to get one (which is not very common for hostels) or if it was just the result of poor planning. Either way the location of the hostel was perfect and it’s a great place to stay at no matter if you’re there to meet people and party or if you just wanna relax. Could see on the pictures that this hostel were going to be fresh and clean, but F'cking hell it was CLEAN. All new built with really nice toilets and showers. The pool were perfect to hang around when the hangover were too much. Only this made the stay here worth it, but the staff were also super cool. The guys with short hair and green eyes really made us feel respected as guests and was happy to help us with anything, och du svenska tjejen va också grym! Thank you, we will come back! The hostel is nice and clean. I think for groups the hostel is ok. But as a solo traveler I would not recommend this hostel to other solo travelers.